This butterfly, a species of blue, is perched on a flower in the malvaceae in Nairobi, Kenya. March 2011. The wings are folded above the insect's back and the undersurface of the wings is shown in this view. 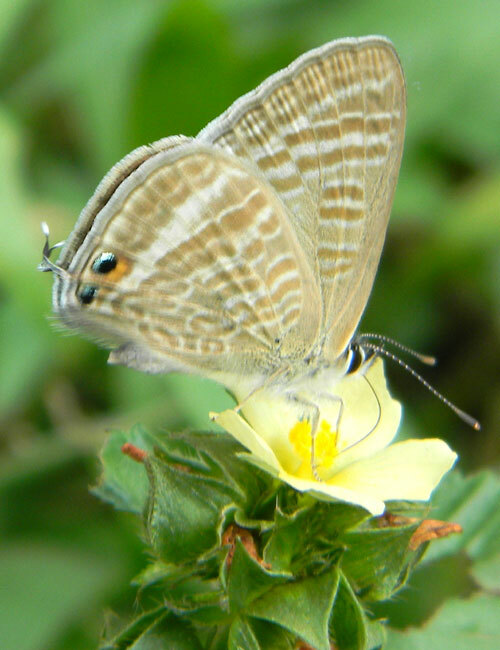 Most Lycaenidae butterflies are quite small; many have wing spans of less than 20 mm. What they lack in size, they make up for with brilliant colors and tremendous diversity of species. The small caterpillars look a bit like slugs and feed on various plants. Blues very similar to this one feed on plants belonging to the Fabaceae. This one appears to be Lampides, also known as the Pea Blue.